Each manufacturer is unique. With so many things that go into the design, production, and distribution of a product and zero room for mistakes, finance leaders, production managers, and executives can’t waste time with manual and error prone processes. Businesses need complete visibility from the shop floor to the boardroom, and more manufacturers are turning to cloud ERP to take control. 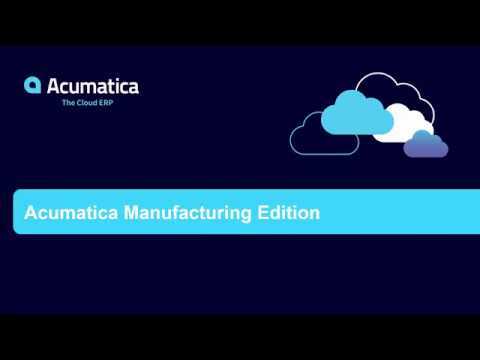 Acumatica was designed for manufacturing organizations, providing a complete, multi-site cloud manufacturing control and planning system for make-to-stock, make-to-order, engineer-to-order, project centric, job shop, batch, and repetitive manufacturing. With Acumatica ERP for Manufacturers, leaders can gain new levels of visibility and control within their entire organization and supply chain. From product costs to inventory management, Acumatica Manufacturing Edition is ready to work for companies in the many industries including Aerospace and Defense, Automotive, Electronic Machinery and Components, Metals, Industrial Machinery and Equipment, Instruments and Related Products, Medical Devices, Transportation Equipment, Food and Beverage, Cosmetics, and more. Integrated throughout your organization, Acumatica bill of material (BOM) software is used to define engineering and financial views of product structure. Efficiently plan and manage inventory, cost, and document manufacturing processes while maintaining full revision control. With Acumatica BOM/Routing module, you can create, maintain, and control master data definitions of products and processes with convenient one-screen maintenance access, managing multiple levels of bills of material for both engineering and costed views of the entire product structure, and controlling costs throughout the process. Control the entire production planning and scheduling process and minimize job costs. Capture the total cost of manufacturing including material, labor, overhead, and outside processes. Create production orders from previous revisions and alternate bills of material. With the Acumatica Production Management Module, manufacturers can leverage technology to simplify production order tracking, manufacturing scheduling, and production performance. Meeting the demands of customers and working with your suppliers is nearly impossible without robust visibility and control. Material Requirement Planning, Part of Acumatica Manufacturing Edition, is ready to handle these needs. Maintain optimal levels of inventory, plan for potential disruptions or demand shifts, and improve customer satisfaction with advanced MRP from Acumatica. Manage and monitor your shop floor schedule and work center capacity, both finite and infinite, with Acumatica’s Advanced Planning and Scheduling Software. This software allows manufacturers to consistently and cost effectively meet customer demands by setting accurate and reliable delivery dates based on actual availability of resources. With real-time data, manufacturers can optimize manufacturing productions by integrating key elements: materials, production capacity, process sequence, and facility schedules. Estimates are one of the most important part of controlling costs and providing timely production. With Acumatica Manufacturing Edition Estimating software, you can improve the accuracy and turnaround times of all your manufacturing estimates. Once you confirm an estimate, you can easily convert it to a bill of material or sales order. Your team can calculate costs and prices for new or existing parts using data such as material costs, work center rates, and overheads. Save even more time with the option of linking your estimate to a quote or opportunity. You’re expected to provide quality and accuracy to your customers. For companies that need to configure and customize products based on unique needs, the Acumatica Manufacturing Edition Product Configurator helps companies to easily modify product features, options, and dimensions to maximize quote-to-order and manufacturing performance. With this rules-based product configurator, you can configure products in multiple ways on quotes, sales orders, and production orders in seconds, take control over revisions, and provide estimates and prices more easily than ever. If you’re in the business of manufacturing, but not in the business of distributing, you need a powerful Order Management platform. An alternative to Acumatica Distribution Management for companies who don’t carry inventory, this software gives you the tools to deliver better customer service, improve vendor relationships, and eliminate paperwork while providing all stakeholders with greater visibility into order management processes. Acumatica, in partnership with JAAS Systems, offers a complete, multi-site manufacturing control and planning system for make-to-stock, make-to-order, engineer-to-order, project centric, job shop, batch, and repetitive manufacturing. Both user-friendly and robust, Acumatica Manufacturing Edition has improved the way manufacturers do business. Sold only through a selective network of leading implementation partners like MIBAR, Acumatica Manufacturing Edition is able to improve the visibility and control of your business—whether you’re a regional player or global organization. Learn more about Acumatica by MIBAR for distribution, manufacturing, project accounting, and customer management by scheduling your free consultation.